For years observers have watched the much publicized developments of artist studios and the Fogo Island Inn by the Shorefast Foundation on Fogo Island. There have been documentaries, magazine articles, news broadcasts at all levels of media and even naysayers writing editorials and commentaries. While much attention has been paid to Fogo Island many are still not aware of the other initiatives and events that have also been created in the same time and space around the Island. As a regular tourist to the various communities, I am continuing to learn about attractions and activities that I’d missed previously. My surprise for today was a brochure called “ I. Taylor Research presents Beyond the Edge”. As I was reading about the audio walk, I realized it was also in the company of its creator, Kay Burns and I took the opportunity to ask a few questions and beg a photo. 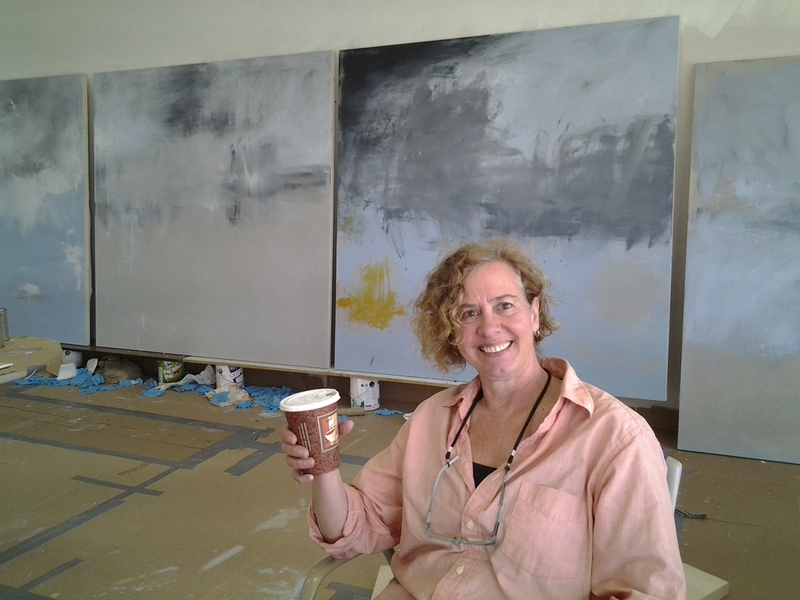 Kay is one of many artists who call Fogo Island her home. She’s a performance artist who, much like myself, merges fact and fiction in the creation of her product. Her “performance persona” is called Iris Taylor and Iris is a member of the Flat Earth Society. I have not yet seen Iris/Kay perform but am aware of Brimstone Head’s claim to fame that it is one of the Four Corners of the Flat Earth. A sign at the base of the hiking trail warns visitors not to proceed to far as there is a risk of falling off the edge of the earth. Kay has developed a guided walk app to be downloaded on either Android or iPhones. This app, “7 Scenes”, has a file called Beyond the Edge, narrated by the Iris persona as she leads a guided walking tour of areas of the community of Fogo. I have yet to try it as I only found out about it but can’t wait to see how it works. Then the specific app for Beyond the Edge must also be downloaded. Do both if these steps where you have wifi to avoid data usage. Enable GSP on your phone and the walk will use this free signal, rather than a data plan to lead to the Edge (and not Beyond) I hope. The tour begins at the painted Rock in the community of Fogo and proceeds across the canal and on to Brimstone Head. 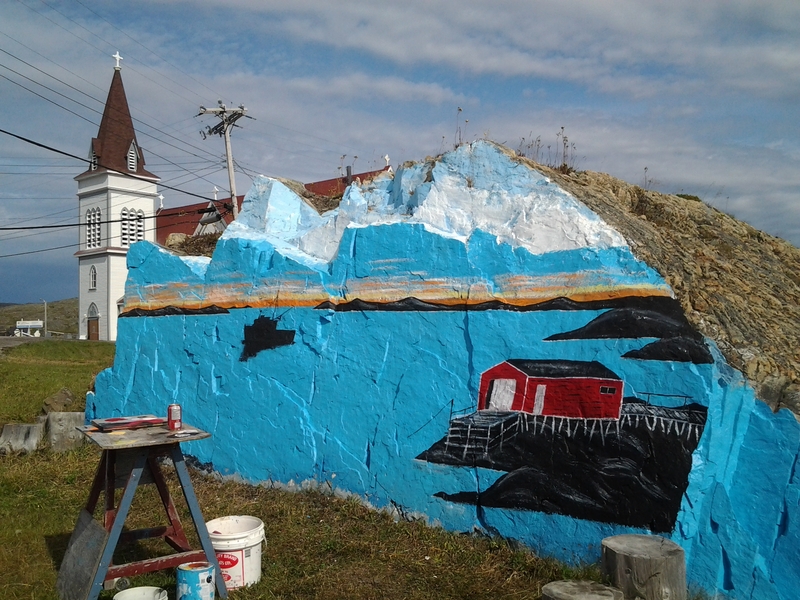 The painted rock in Fogo. I had the pleasure of doing this tour with family from Alberta last weekend and it was indeed a sight to behold. Although, I, personally have done the trek many times, it is always a pleasure to do it with new people to see their expression and the look of awe on their faces. We also had the pleasure of recreational food fishing and saw a shark and did manage to capture some of it on video. The experience was amazing because my sister-in-law had a big fish on at the time and was trying to get it to the boat and the shark came almost to the top of the water and she actually thought she had the shark on so there was much excitement. I too had a fish on at the same time so was more concerned about getting my fish in before the shark got it but it actually swam all the way around the boat and I did manage to see it, although, not to the extent that my two in-laws saw it. We also stayed at the Fogo Island Inn and the experience was also truly amazing, because, their is no doubt that the Inn has captured the culture of Fogo Island.